Home » doctor who , reviews , science fiction , television , the next doctor » Chris declares "The Next Doctor" the best DOCTOR WHO Christmas special yet! Chris declares "The Next Doctor" the best DOCTOR WHO Christmas special yet! This past season of Doctor Who has seen some of the best storytelling in the entire forty-five year history of the franchise. More than six months later and I am still as much in awe at "Forest of the Dead" as I am enthralled about what it hinted about the Doctor's future. And of course there was "The Stolen Earth"/"Journey's End" two-parter that hailed the return of Davros: possibly the greatest villain in all of fiction. So is it possible that the now-traditional Christmas special of Doctor Who could be just as up to par with what has already transpired in 2008? More to the point: could this year's special "The Next Doctor" please be much better than the glorious mess that was last year's "Voyage of the Damned"?! In so many words: "Yes yes YES!!!" "I'm the Doctor! Simply the Doctor! The one, the only, and the BEST!" "You're mad! Both of you!" "This is hardly work for a woman." "But that's a screwdriver. How is it... sonic?" "I was holding this device. The night I lost my mind. The night I regenerated." "Okay. I think we should run!" "There she is: my transport through time and space. The TARDIS!" 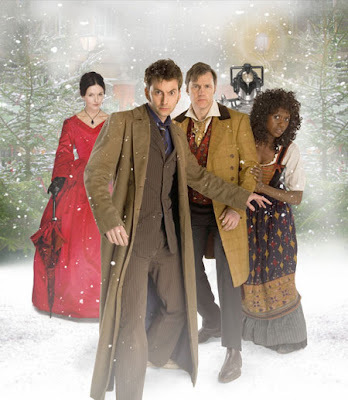 The Doctor (David Tennant as the character's tenth incarnation), still without a companion following the events of "Journey's End", has arrived in a festive London square circa Christmas 1851. But as much as he is delighted by the sights and sounds of the holiday season, a woman crying out "Doctor!" snaps him back into full-tilt adventure mode. The Doctor runs down an alley and finds that it is a young lady named Rosita (Velile Tshabalala) who has been calling for him. But alas! Rosita does not take him seriously: she's been screaming for the Doctor and the Tenth Doctor is apparently not good enough. And then another man calling himself "the Doctor", played by David Morrissey, arrives at the scene. Could this possibly be a future generation of the Doctor? Just as it goes to the title sequence we witness both Doctors prepare to face down a Cybermen-manufactured monstrosity. David Tennant announced in October that he would be leaving the role of the Doctor following this last batch of specials (which are being produced in lieu of a proper 2009 season). So the question early on becomes: is David Morrissey being primed to play the eleventh or even some other future version of the Doctor? Aye, 'twould be telling. But suffice it to say I loved his portrayal of the Next Doctor: it reminded me a bit of the Captain Hammer character from Dr. Horrible's Sing-Along Blog in terms of pure bravura, albeit touched with a hint of tragedy. From the getgo I found it easy to believe that this might be the Doctor that we know will eventually come (from how River Song described him in "Forest of the Dead"). That there is such great rapport between Next Doctor and Tennant's Tenth Doctor only helps to build the supporting case for this being a glimpse of a forthcoming regeneration (something which has never been done before in the history of Doctor Who). Velile Tshabalala is a lot of fun to watch as Rosita, and Dervla Kirwan (known for her previous work on Ballykissangel and Goodnight Sweetheart) turns in a positively menacing performance as Miss Hartigan. She's the proprietress of an orphanage and is betraying humanity to the Cybermen by helping them bring about the rise of the Cyberking: a Master Mold-ish "super Cyberman" with a factory in its chest that is ready to convert millions of people into Cybermen. Last year's special, "Voyage of the Damned", was the perfect example of something that George Lucas noted years ago: that special effects without story backing them up are a dreary bore. Outgoing Doctor Who showrunner Russell T Davies has learned his lesson well, because while "The Next Doctor" easily rivals "Voyage of the Damned" in terms of effects effort, it squarely remains a story focused on in-depth characters and engaging plot. Indeed, I will readily declare "The Next Doctor" to be the best Christmas special yet of the revived series! It's action-packed and replete with the drama, mystery and humor that Doctor Who at its best is renowned for. If I have one complaint though, it's that I think it's well past time for the Doctor on the new series to face down the "old school" Mondas-spawned Cybermen. The ones that menace the Earth in "The Next Doctor" are still the models from the parallel world that was first introduced in "Rise of the Cybermen". But I'm willing to let that slide this time, if only because of the Cyberking: one of the hands-down most brutally awesome spectacles that has ever been seen in a Doctor Who story. "The Next Doctor" gets the full Five Sonic Screwdrivers on my Doctor Who rating scale. Well worth the time to download via Bittorrent from our Brittish brethren (of whom much thanks is owed for their work to put it on the Intertubes on Christmas Day!). Next up for the Doctor: "Planet of the Dead", coming this Easter. Giant clockwork steampunk Cyberman. Davies has redeemed himself from Voyage of the Damned last year. A very marvellous episode. And yeah Chris, I can't believe you didn't mention the flashback on the Doctor's previous lives! That was wonderful! And yes, it was an excellent touch! Best Christmas episode by far. Finally got around to watching it last night, and it was a whole lot of fun.